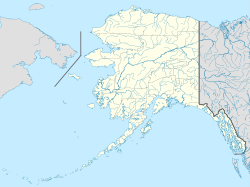 Diomede is a city in Alaska, United States. It is on Little Diomede Island. The island is in the middle of the Bering Strait. It is near the International Date Line. There are no roads on the island. There also are no banks or restaurants. A general store has basic supplies. 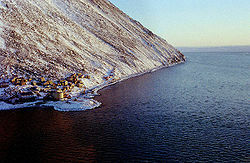 Diomede is the only place people live on the island. Mail is delivered to the island by helicopter. It is the only place in the United States that uses a helicopter for mail delivery. ↑ "Directory of Borough and City Officials 1974". Alaska Local Government (Juneau: Alaska Department of Community and Regional Affairs) XIII (2): 30. January 1974. This page was last changed on 21 June 2018, at 18:01.